The foam roller is something that I think all runners love to hate. Using a foam roller during hard training brings new meaning to the phrase “hurts so good.” Massaging out your muscles can help break up adhesions and knots in the muscles and can also help stimulate blood flow to the muscles and help remove waste products. Here, I share some of foam rolling basics for runners, hitting the major muscle groups of the legs. So, if you’re new to foam rolling, this post is for you! Before we get into how to position yourself to massage out the major muscle groups of the legs, a quick how-to on how to move yourself along the foam roller. I was taught to move your leg about an inch along the roller, move back about half an inch, and then forward again an inch, slowly moving up and down each muscle group. For me to completely roll out my legs, it takes about 10 to 15 minutes, depending on how sore I am. Quads. I think my quads tend to get the most torn up when I’m training hard. I get lots of knots and they get really sore, so I spend a lot of time rolling out my quads. To roll out the quads, lie with your quads on top of the roller, keeping your opposite leg on the ground beside you. You can control how much pressure you massage with by either putting more or less pressure through the opposite leg and/or your hands. If I find a spot that’s really tender or knotted, I’ll gently rock back and forth on the roller on that spot, focusing on that trigger point that needs to be released. Shins. The shins have always been tricky to massage for me, but after battling a horrendous case of shin splints a couple of years ago, I found that this configuration worked best for me. Coming to a tabletop-like position allows me to put more of my body weight over my shin, allowing me to massage a little deeper, which my shins often need. I control how much weight I’m putting on my shin by controlling how much I press down on the opposite leg next to the foam roller. Hamstrings. The setup to roll out hamstrings is pretty much the opposite of the quads, like you would expect. The leg you’re rolling sits on top of the foam roller and you use your body weight to press down. If you want more pressure, stack the leg that’s not being rolled on top to add more weight down on the roller. Calves. There are a couple of variations for how you can roll out your calves, depending on how much pressure you need to get the right amount of massage. If the muscle is really sore, you can keep your seat on the ground and one leg on the roller. For more pressure, stack the opposite leg on top of the leg you’re working on, or for even more, use your arms to lift your seat off the ground. Again, the key is to modify how much body weight you put on the area that’s being rolled so that you have the right amount of pressure to get a proper massage, but not so much that your muscles completely lock up. IT Band. Saving the best for last. This is the one that most runners really love/hate because for many of us, the IT band gets very tight when we’re training. When I’m foam rolling, I try to spend extra time massaging my IT band because a tight IT band can lead to so many injuries. You can control how much pressure you’re putting on the IT band here by putting more or less weight in the front leg and in your hands. Runners: Do you know the basics of foam rolling? 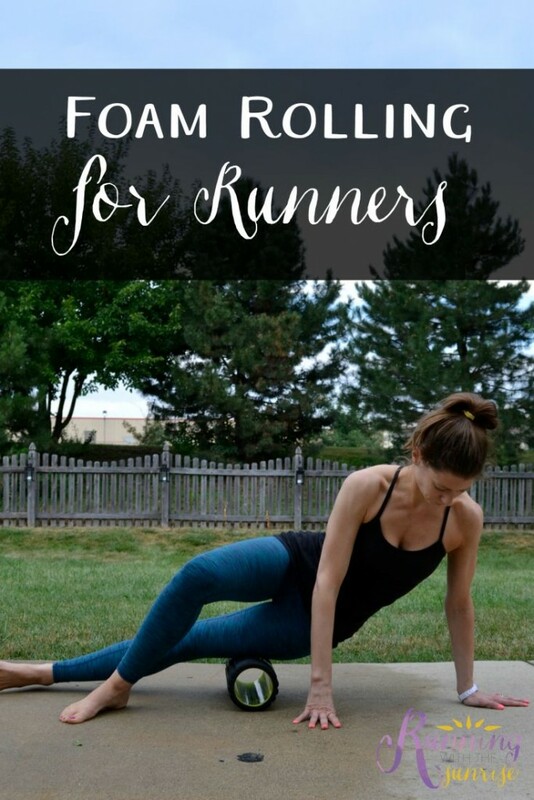 I hope you found this mini tutorial helpful, especially if you’re just starting to add foam rolling into your running routine. Let me know if you have any questions about foam rolling, and feel free to check back here periodically. I’ll add any foam rolling resources I stumble across. I know Ange is planning on putting together a great post on foam rolling that I’ll be sure to pass along. Do you have a favorite roller? That’s such a good habit to get into! I go in spurts, and I really need to be more consistent with my foam rolling. Kudos to you for keeping up on it! Rolling out my quads and calves helps so much! My foam rolling is getting old and worn (I’ve had it for at least four years now) so I’m shopping around for a new one – so many options! I’d really recommend The Grid–I’ve been so happy with it and I’ve had mine for four years. The PVC interior means it holds up really well to wear and tear. How do you think I got the idea to write this post–I’ve been spying on you! 😉 Just kidding. My IT bands and hips are always the worst! I brought my lacrosse ball to blogfest. You know I love a good rollout! Something that I talk about often with my clients is the importance of rolling out glutes–so often we don’t realize how important they are to the functioning of what’s above and below! Hurts so good!!! Foam rolling really helps me! Yes, right? Glad you’ve found it to be helpful! I know it helps me stay injury free. This was such a great post. Thank you so much for sharing. I literally have 3 different rollers and I just stare at them when I come home after a run lol. I know I need to stop being lazy and foam roll and I’ll be using this blog post for tips. Thank you! Haha, right there with ya on the multiple rollers. Sometimes you need a different shape to get a sore spot! Wow, I’v foam rolled daily for 10 years and I’ve never seen a shin roll. Do you think a roller is more effective than The Stick? That’s how I’ve been hitting that area, but I’m always looking for a better way to stay balanced. Really, really love my foam roller! It’s the only thing that really helps me sore hamstrings after a long run. Thanks for all the great pics and tips about how you use yours.